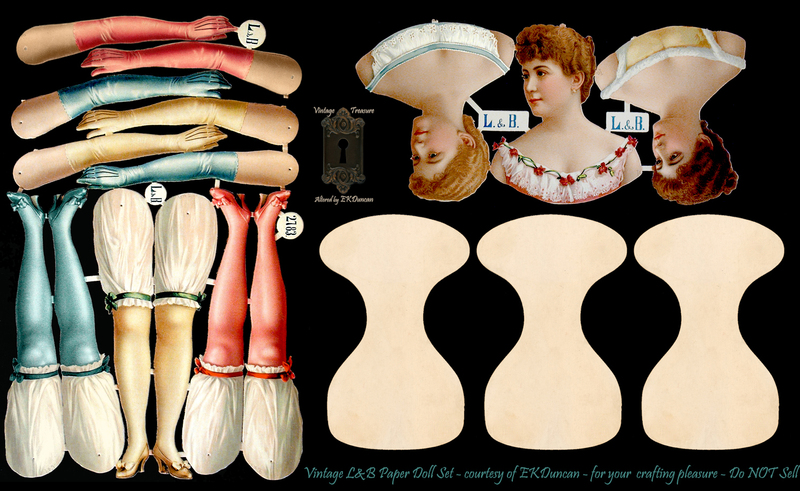 EKDuncan - My Fanciful Muse: Two More L&B Ballerina Victorian Paper Dolls. The two latest additions to my growing collection of L&B dolls. Two more L&B ballerinas have been added to my growing collection. I won these off eBay about a week ago and even though they are not in top shape I at least have them in my collection until I'm able to get mint copies of them. The good thing was that since there were two copies of each doll; I was able to salvage out one fair copy of each from all the parts. They both scanned and cleaned up well enough that I now have digital copies that will allow me to create whatever paper art dolls strikes my fancy. This is what the dolls looked before I carefully took them apart. 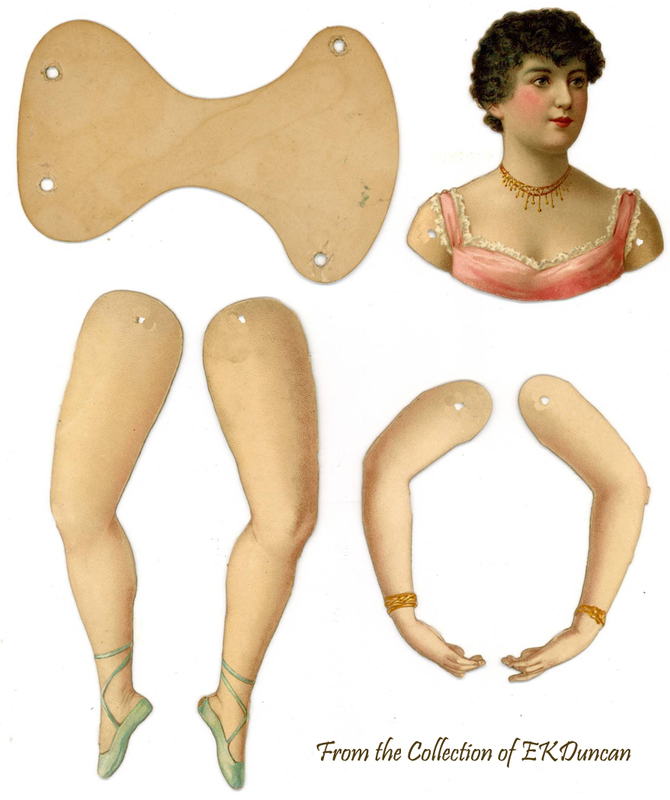 Broken arms, broken legs, missing and bent parts. of all the eyelets so I could separate all the pieces. 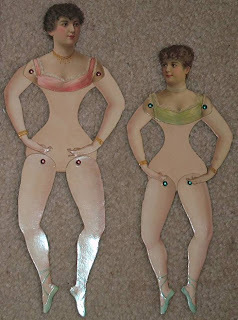 These are scanned and cleaned up images of both new paper dolls. art dolls from them later on. (I did not want to clean them up too much since I think a bit of the "warts"
The L&B Ballerina and Prima Donnas were originally made and sold in 4 different sizes. I've only had the largest size dolls in my collection until today. 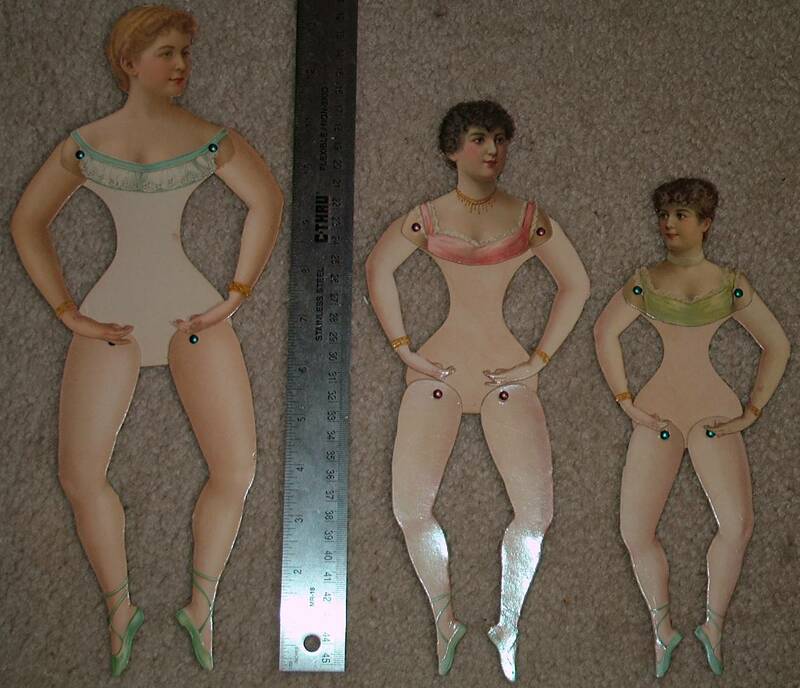 Currently, I'm lacking an original example of the smallest size paper doll but I know I will eventually have that in my collection as well. It's just a matter of time. This is what the 3 sizes look like next to each other. Here are the sizing breakdown of what I know so far. 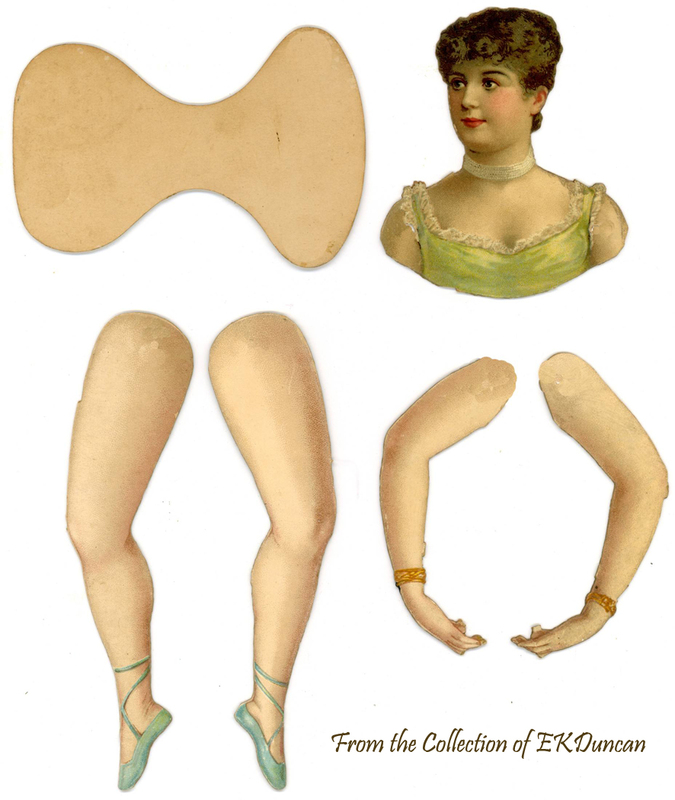 Torso 5 1/2" - Head 4" - Legs 7" - arms 4 1/2"
Collecting these Victorian L&B paper dolls has been a fascinating quest. 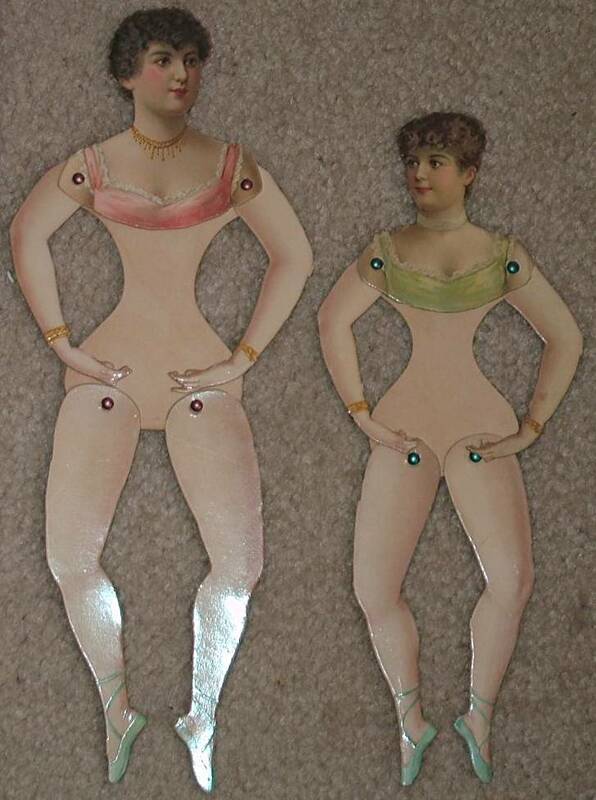 I hope to eventually find out what famous people of the day these two beauties represent and with a bit of luck I will eventually find them in mint, uncut condition. The great thing about having spares and left over bits and pieces is that once I get my mint replacements I intend to assemble and create art dolls from these less than perfect examples so I can frame them. I'll add shoes and other accessories to hid the missing and broken parts so no one but me will know the finished product is anything less than perfect. This way even the most battered dolls will be a thing of beauty on my wall while the mint dolls remain protected and safely stored away. Thank goodness they are finally in your caring hands. 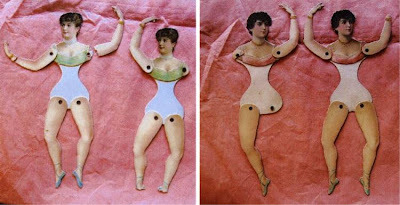 What do you do with the dolls after you've restored and reprinted them? Do you store them in acid free tissue and lock them in a fire-proof vault? Gosh, I'd be so terrified I'd probably donate them to a museum. They are all so exquisite. 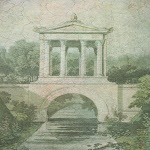 Hi Avant-Gardenist! Thanks for the kind words. I love these old ladies and hate the thought that they are disappearing left and right. and one shudders at the thought of them having been thrown away by the dozens over the years due to damage or non-interest. I hope in some small way I'm preserving their image be it in rough state or prime condition so others can download an play with them too. 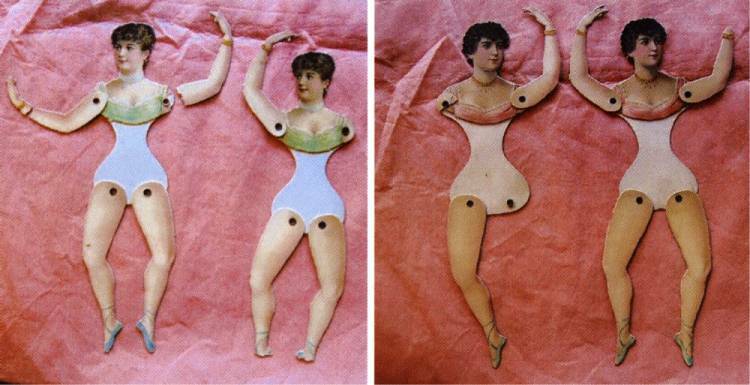 The sad thing is that there are collectors around the world that have mint conditions of every one of the L&B jointed dolls ever created, yet their images are not really available on the web for others to enjoy and use. That was my mission when I began buying them and then started my blog. I considered myself blessed to have acquired some of these beauties and wanted to make them accessible to others who might never have seen one or might never get to own an original. 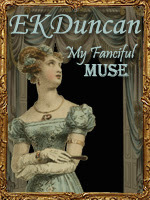 Thanks so much for letting me know you are enjoying seeing these grand Victorian ladies too. The original dolls parts I have are all stored in special archival plastic sleeves in a binder. These are heavy duty, acid free clear storage sheets with special dividers and pockets to separate each doll part so that one piece is not touching another piece. This way they are dry, safe and dust free as well as kept away from light. If one of our museums here in Raleigh NC ever requested their loan for display; I'd be all for it but I don't think my little collection would impress them very much. Still I'm thrilled to have them and even more excited about sharing them with all you who are searching to find decent quality images of them. I hope to be lucky enough to collect more of them in the future but the few that have surfaced on auction sites recently are either dolls I already have, too damaged, or beyond my budget. But that's the way it goes. Hey Patty - You are welcome and thanks for letting me know you like them. Your dolls are beautiful. Do you have any clothes that would fit them. I would love to make a set for my grandaughter. 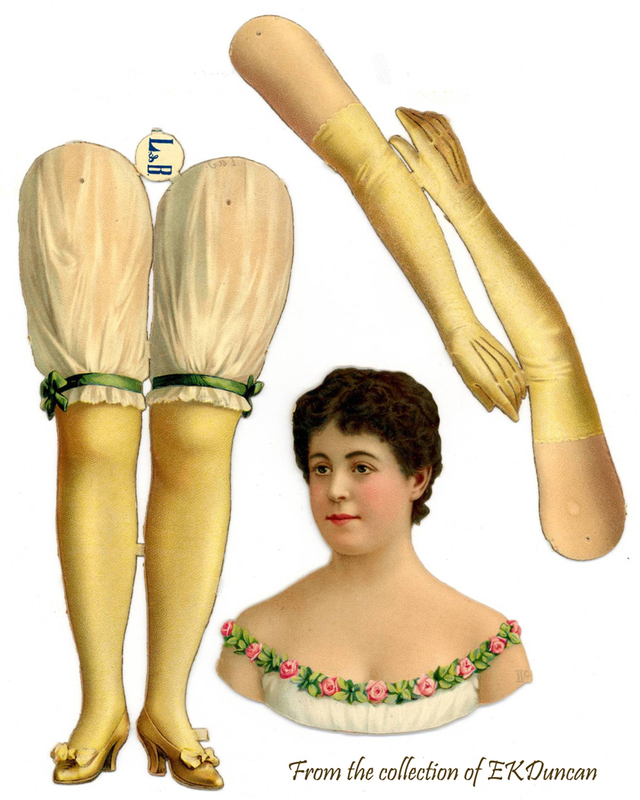 Hi Eugenie - I'm glad you are enjoying the L&B jointed dolls I've been posting. 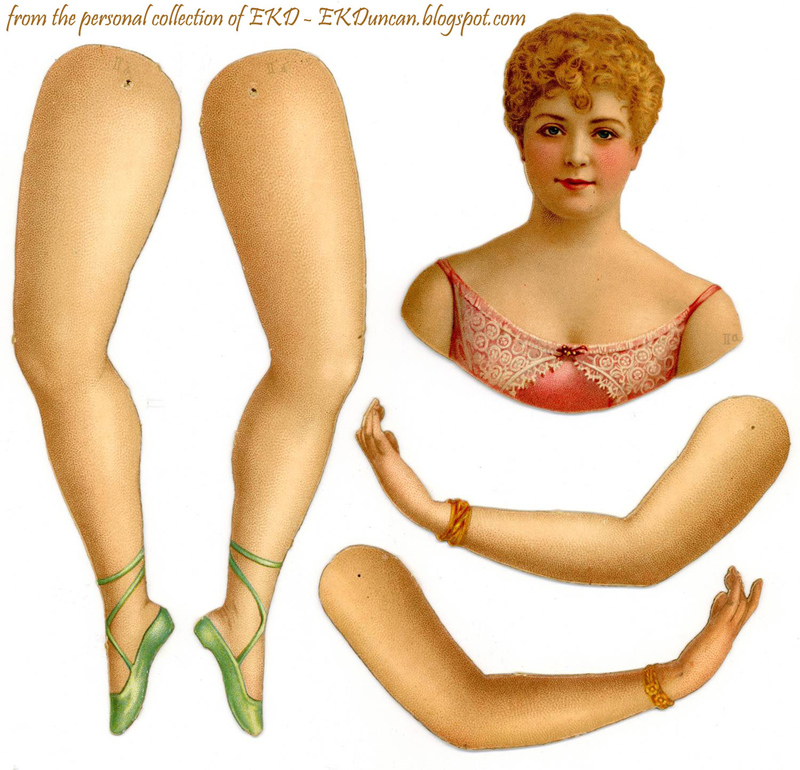 They are some of the gems in my personal collection and the fun thing about these dolls is that they were created so their owners could get super creative in costuming them. Technically no costumes were ever made for them. The idea is you are to dress them as you see fit using crepe or decorative paper, fabric, lace, trims... your imagination is your only limitation. 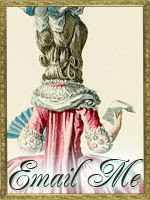 You can see a few examples of decorating examples for them by viewing the following posts on my blog. 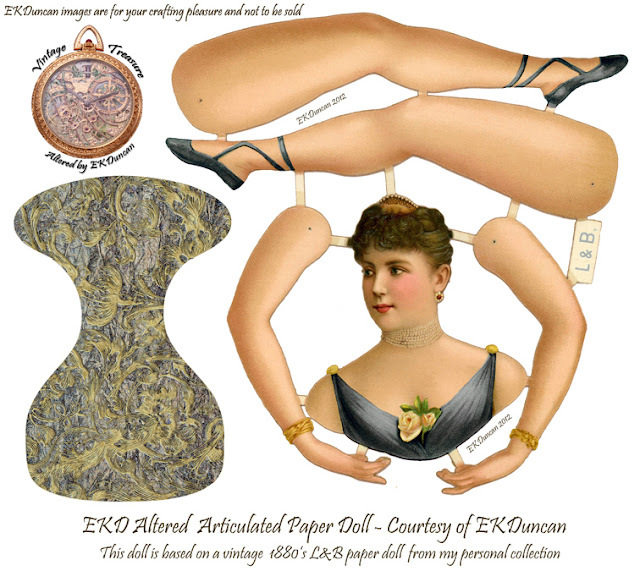 http://www.ekduncan.com/2013/01/vintage-paper-images-sneak-peek-for-2013.html shows a vintage Dennison catalog page showing two handmade costumes created from crepe paper. 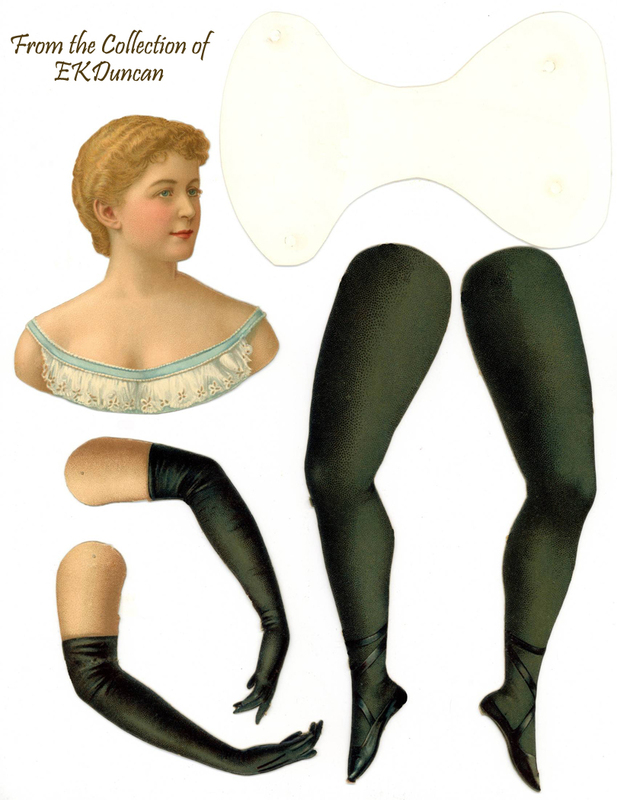 (the very bottom of the post) shows some costuming ideas I've used in the past as well as two vintage "dressed" examples that were done using crepe paper. To see all the posts I've done regarding L&B images and all the versions of the dolls I have or have altered you can click the Land B "label" on the right toolbar or go to this link, which will start with the most recent post regarding L&B images till you get to my very first blog post that started with one of my L&B beauties. 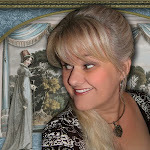 I hope you and your grand-daughter have hours of fun making and decorating these Victorian beauties.